When planet Krypton is about to explode, Jorel (Marlon Brandon) and his wife put their baby son in a star-shaped spaceship and send him away towards planet Earth. The child lands on Earth already as a toddler. A middle-aged couple adopts him, and names him Clark Kent. He grows up in Smallville, until his eighteenth birthday, when his adopted father dies of a heart attack and Clark decides to leave Smallville and his adopted mother, and head north, all the way to the North Pole. The green crystal that Jorel inserted in the space ship, which contains Clark’s family history, he throws to the wind and lands on top of an iceberg that immediately replicates into an icicle pyramid. Inside there, Jorel appears as a hologram explaining Clark his provenance. 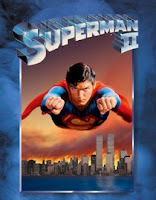 Clark (Christopher Reeve) moves to New York City, gets a job as a journalist at the Daily Planet, falls in love with a fellow journalist named Lois Lane, who doesn’t feel attracted to clumsy Clark. Then Lois starts getting into sticky situations more often and always gets rescued by a handsome caped-man, whom she calls Superman. Superman’s nemesis, Lex Luthor (Gene Hackman) goes to Ethyopia--site where a meteorite shower took place in 1938, the year when planet Kryton exploded--and steals from a museum a piece of meteorite that turns out to be Kryptonite, the substance that can destroy Superman. Luthor has the plan of destroying California with the help of two nuclear missiles, so Superman has to get there in time to save California and its people. The catch is that while saving all those people from mayhem, he may not be in time to save Lois from death. The special effects are as fresh and believable as they were when the movie was released; I was pleasantly surprised by that! 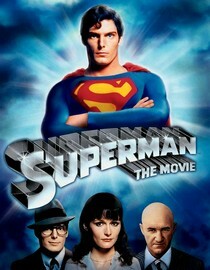 Christopher Reeve owns the screen as Superman, and he looks great doing it too! The film doesn’t have a strong plot, but I guess it doesn’t matter, there’s plenty of action happening to counteract that flaw. A must see! General Zod and two of his followers, three traitors brought by Jorel before planet Krypton’s Council in the first movie, who were found guilty and condemned to wander the universe trapped in a hologram, break free due to the shock waves generated by the hydrogen bomb when it exploded. Having the same superpowers possessed by Superman, they first learn of this planet in the moon where they encounter astronauts in a mission. By the time they arrive on Earth, they have discovered they have superpowers and start causing havoc. Lex Luthor (Gene Hackman), imprisoned in the first movie, escapes from jail with the help of his lover and heads to the North Pole to uncover the link between Superman and that place. Superman, on the other hand, is covering a story in Niagara Falls, accompanied by Lois, where she realizes that Clark is Superman. Since they both love each other, Clark (Superman) decides to let Lois in on his secrets and both go to the North Pole. There, Superman makes the choice of becoming a mere mortal to love Lois freely. But if he becomes a man, his real mother warns, there’s not going back; his superpowers will be lost forever. He agrees with that, or so it seems until General Zod takes control of the planet and subdues the president of the U.S. However, saving the planet and defeating his four nemeses, General Zod and followers together with Luthor, will prove more than he ever thought possible. The elements that made the first film a classic remain in this sequel, the actors play the same roles and the special effects are believable. The plot, however, is stronger in this movie than in its predecessor, enhanced by car explosions and superheroes fights so characteristic of the 1980’s. Again, this one is a must see! Please leave your comments and/or suggestions.